Together with my own Habwa Hiba was the smallest in the litter but like her sister very persistent and stubborn, so they quickly caught up with their siblings without the need for any supplementing. They have both grown into substantial little girls, with an attitude to match. Hiba was also the only one who immediately knew the correct procedure when confronted with a saucer of milk for the very first time. Granted she threw up, having gorged herself on goat's milk, but an auspicious start nonetheless. 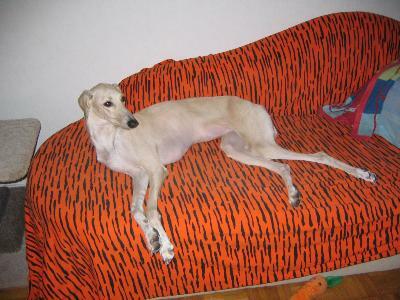 Hiba kept us guessing from day one: we thought her long puppy coat indicated that she was feathered but she turned out smooth. Our little curlytailed enigma seduced her new owner Heli Josefsson by climbing up in her lap and going to sleep there the very first time they met. 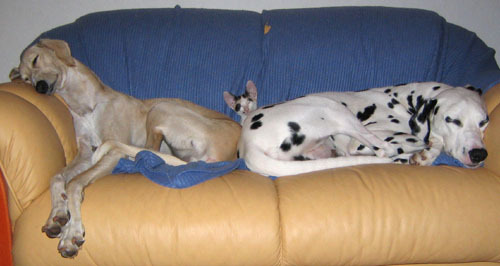 It paid off, because she got a loving home and a live-in Dalmatian friend. Heli and Hiba were quite a sight leaving our yard: Hiba was with Heli for the first time, outside our property for the first time, on lead for the first time, yet she trotted along like it was all old hat to her, not even bothering to look back. I still regret neglecting to take a picture of them! 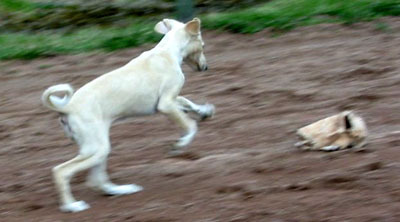 As you can see Hiba has already tried a bit of racing at the Vätti track at the tender age of 10 weeks! 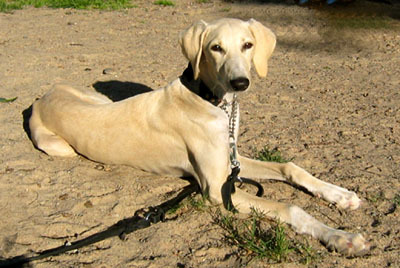 Hiba can frequently be seen at the track or at lure-courses. Hiba made her show debut in the autumn with a verdict of "very good". Hiba is a hosha-like fineboned princess type, although underneath is a will of iron! She visits her mom like a good girl and takes part in racing and shows occasionally.